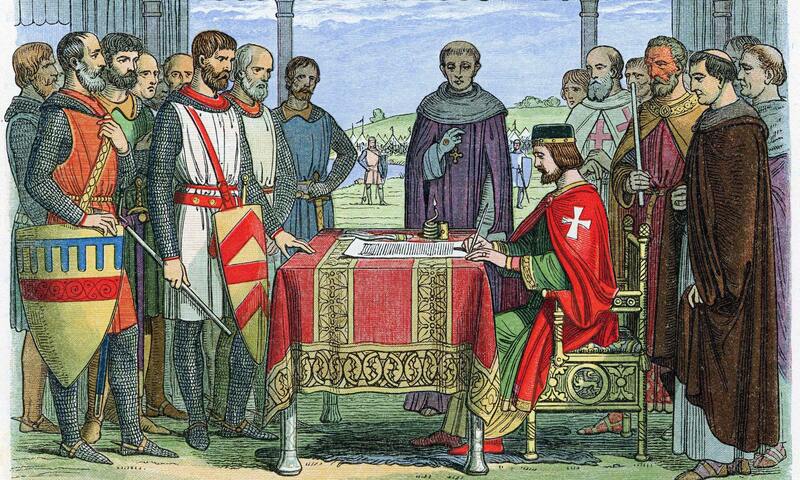 Governance and governing have historically was associated with the role of the Sovereign governing his (or occasionally her) ‘sovereign state’. 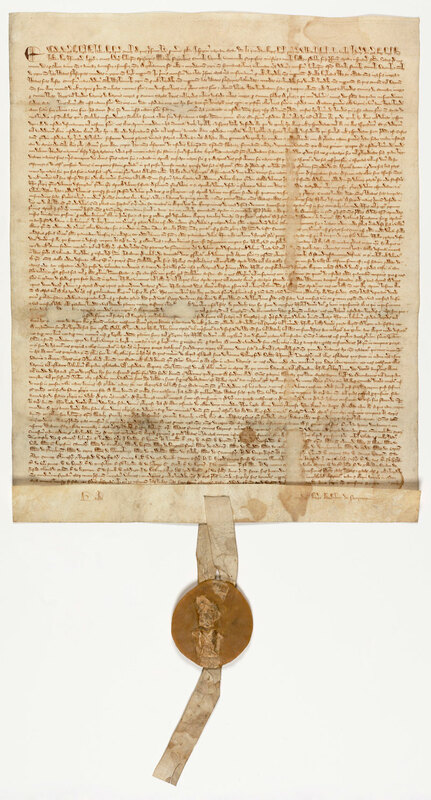 Over the last five or six centuries the exclusive power of the Sovereign has largely been devolved to governments of one form or another but the functions of making laws, authorising the collection of taxes and providing direction to the citizens of the state remain fundamentally unchanged. 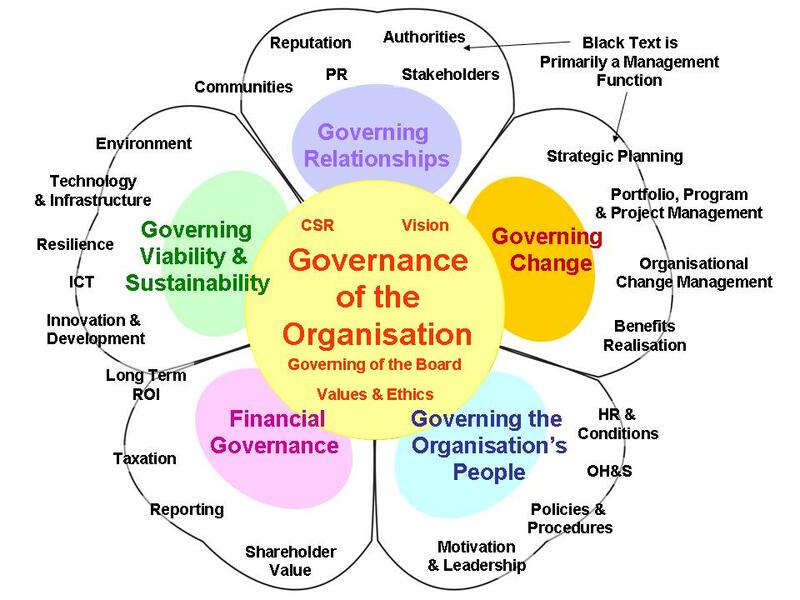 The concept of corporate (or organisational) governance grew out of this overarching concept; to imply there was a similar role within an organisation for a ‘governing body’ to take responsibility for the governance of the organisation. This concept of a governing body setting the ‘rules’ by which an organisation operates and providing guidance on the organization’s objectives has many parallels with the functions of a government. A government may choose to declare war on another country and provide resources and directions to its military but, at least for the last 2 or 3 centuries, governments have learned not to interfere in the actual conduct of the military campaigns – fighting the war is the responsibility of the professional military. Similarly the governing body of an organisation can set the objectives for the organisation and define the rules by which members of the organisation should operate but is wise to refrain from becoming actively involved in managing the actual work. The paramount reason for separating governance and management is the simple fact it is almost impossible to take an objective view of work you are actively involved in! With these thoughts in mind, I started to consider the functions and purpose of governance to contrast with the functions and purpose of management. The functions of management were quite easy to define, the work was done 100 years ago by Henri Fayol in his 1916 book Administration Industrielle et Generale, while there has been some academic argument about the syntax of Fayol’s five functions of management, they have basically stood the test of time. These are outlined in The Functions of Management. 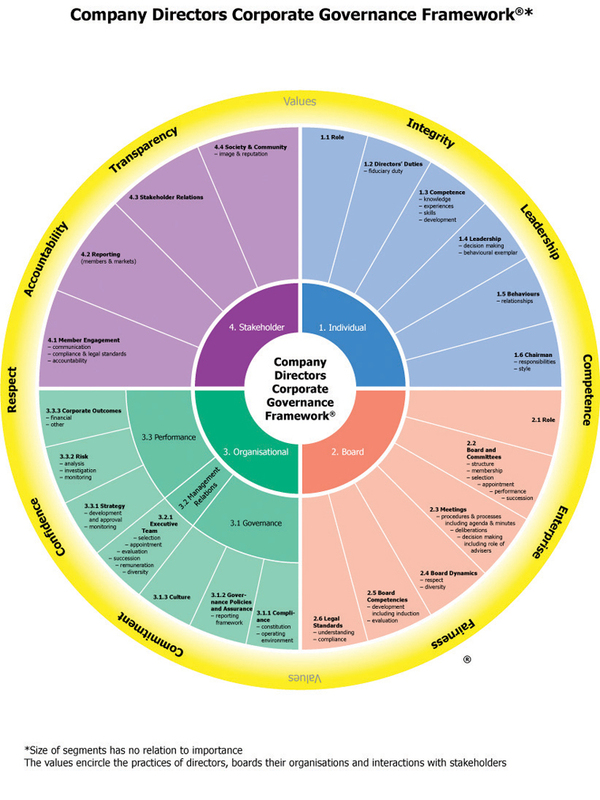 Elements of defined or required practice such as the ASX listing rules and the AICD Governance framework. None of these sources actually describe what the governing body does or the extent of the governance processes within an organisation. These are the questions I’ve been focusing on for the last couple of years. The functions of governance have been described in The Functions of Governance, so far there has been no significant disagreement, that I’m aware of, that would indicate the need for change. 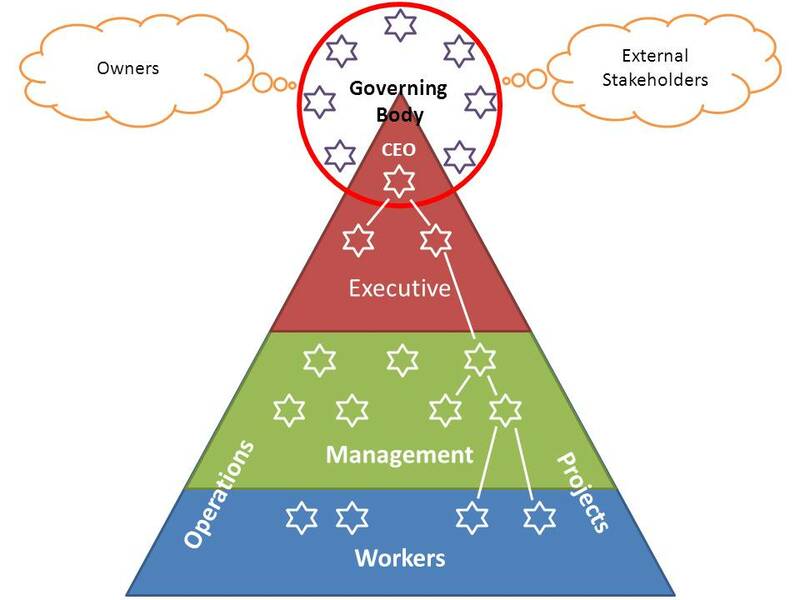 The functions of governance are also mapped to the functions of management and suggest a clear difference in purpose between governance and management that can be summarised as ‘governance sets the objectives and rules for the organisation, management works within the rules to achieve the objectives’. A closely coupled, symbiotic relationship. The responsibility for governance seems to be clearly defined by law makers and regulatory authorities. The governing body is held accountable for the actions of the organisation it governs; this is the Board of Directors in most commercial organisations, in others the person, group or entity accountable for the performance and conformance of the organisation. Having established the functions of management and governance, the fundamental question posed in this post is does organisational governance exists as a separate entity or is it simply an extension of ‘good management’. To a degree this is a ‘chicken and egg’ problem. Does the functioning of an effective governing body lead to ‘good management’ or does ‘good management’ embody the elements of good governance as an integral element in the overall functions of management (ie, Fayol’s five functions need expanding to include governance). The consequence of the first option is the presence of a governing body which has as its primary function the oversight of the organisation’s management. The consequence of the second is so-called ‘governing bodies’ such as a Board of Directors, are in effect simply the first, and most senior level of management. There are a lot of writings that suggest the second option is at least considered viable by many commentators, a view I strongly disagree with. However, this month’s magazine published by the Australian Institute of Company Directors contained a number of articles on ‘cloud technology’ and ‘big data’ suggesting Directors should be making management decisions on a daily basis based on current sales information, etc. Similarly there are numerous publications describing various mid-to-low level management committees such as project steering committees as ‘governing bodies’ responsible for the ‘governance of’ a project. However, a project steering committee is in essence no different to any other management committee responsible for overseeing the work of a management entity; therefore under this scenario, every management committee responsible for the oversight of a management function is a ‘governing body’. The consequence of this line of argument is the proposition that governance and management are integral and there is no significant difference in the entities that undertake the work. Every level of management from the Board down is responsible for delivering good management which incorporates governance. Ensuring the conformance and performance of their management and the organisation as a whole. The primary advantage of this approach to governance is the functions of management are separated from the functions of governance. It is virtually impossible to have an impartial view of the work you are actively engaged in and one of the key responsibilities of the governing body is to oversight the performance of its management; the law says so! Therefore, I suggest good governance requires a clear separation of the management and governance functions for no other reason than the need for the governing body to be able to objectively oversight the performance of it management. But this raises practical issues. A carefully designed governance framework. Roles, responsibilities, decision limits and escalation paths need to be defined. Clear rules for managers to follow in the performance of their management responsibilities. 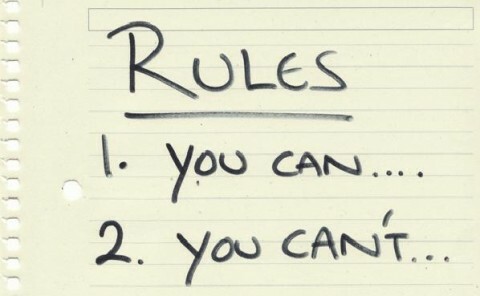 Managers should be personally responsible for following ‘the rules’ and for ensuring the people they manage follow ‘the rules’. Complying with, and conforming to, the objectives, ethics and culture of the organisation should be a condition of employment and a clearly defined management responsibility. Ensuring any governance function is separated from the management function being governed. Assurance and conformance cannot be in the same place as management responsibility for performance. For example, a project steering committee should be responsible for providing direction and support to the project management team to ensure the performance of the project and the achievement of the project’s objectives (a management function) – ensuring conformance with ‘the rules’ is also part of this management responsibility. Assurance that these objectives have been achieved is a governance function that has to sit in a separate reporting line. In many organisations the PMO may be the entity tasked with this responsibility. However, while the governing body by necessity has to devolve aspects of its responsibilities to people and entities within the overall management structure, the governing body remains responsible for the design of the governance framework and accountable to the organisation’s owners and other external stakeholder for the performance and conformance of the organisation and the validity of any assurances provided by the organisation to regulatory authorities. So where does this leave questions such as the use of ‘big data and ‘the cloud’? I would suggest the responsibility of the governing body is to understand the technologies sufficiently to be able to set sensible objectives and ethical parameters for the organisation’s management to work within and then to ensure their management are working to achieve these objectives. It is no more the responsibility of the governing body to ‘manage big data and use it to make decisions on a daily basis’ than it is the responsibility of a steering committee to ‘govern’ a project. The responsibility of the governing body is to govern; the responsibility of a management committee is to manage. This concept of separate functions and focus is not intended to imply an antagonistic relationship. In the same way every high performance soccer team blends people with different skills and responsibilities into a tight unit, a goal keeper needs very different capabilities to a striker; a high performance organisation needs a blend of capabilities: effective governance, effective management and committed staff. Certainly members of a performing team support each other and will help to correct deficiencies and errors by others within the team (high performance organisations are no different); but if the team start to mix up the skills and responsibilities the overall team performance will suffer (the consequences of steering committees pretending to be governance bodies is discussed in a 2012 post Management -v- Governance). The functions of management are defined in The Functions of Management. The functions of governance are defined in The Functions of Governance. A high performance organisation that is capable of achieving sustained superior performance combines both governance and management in a clearly delineated governance framework, supported by a clearly delineated management structure. Far too many governing bodies spend far too much time focused on rules, conformance and assurance. While these factors are important they should be an outcome of good governance not the primary focus of the governors. When an organisation sets high ethical standards and invests in building an executive management culture that supports those standards the need for ‘rules’ is minimised and the organisation as a whole focuses on doing ‘good business’ (see: Corporate Governance). The order of the functions outlined in The Functions of Governance, places: ‘Determining the objectives of the organisation’, ‘Determining the ethics of the organisation’, and ‘Creating the culture of the organisation’ ahead of both assurance and conformance. The rational being creating a culture of ‘doing the right thing’ that extends from the very top of the organisation to the very bottom, means most people most of the time will be doing the ‘right thing’ making assurance and conformance a relatively simple adjunct, there to catch the few errors and malpractices that will inevitably occur. A very strong endorsement of this approach to governance has recently come from one of the world’s most successful business people, Warren Buffet. His recent memo to the top management of his holding company, Berkshire Hathaway’s subsidiaries (his ‘All Stars’) emphasised that their top priority must be to ‘zealously guard Berkshire’s reputation’ (read act ethically). He also reminded his leadership team that ‘we can afford to lose money–even a lot of money. But we can’t afford to lose reputation–even a shred of reputation’. His advice to managers also included this good advice ‘There’s plenty of money to be made in the centre of the court. If it’s questionable whether some action is close to the line, just assume its outside and forget it’. This is a simple ethical guideline that avoids the need for pages of precise ‘rules’ designed to map the edge of legality drafted by lawyers and argued over endlessly. See more on Ethics. Reading the memo, its clear Buffet has built a massive organisation based on an ethical culture, employs executives that reinforce the culture, and still makes a very good profit. It’s a long term investment but infinitely preferable to the sort of issues that confronted Salomon Bros., 20 years ago (see: Warren Buffett’s Wild Ride at Salomon), the banks associated with the GFC, and the on-going damage continuing to be suffered by the Australian banks as more ethical failures come to light. 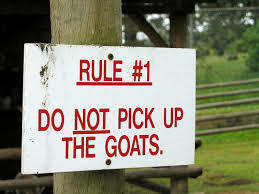 I’m sure they all had hundreds of ‘rules’ some of which may even have been sensible.